This week Sharon Van Etten releases her latest studio album, Tramp. Of all the music released so far in 2012, this album is the one I have most recommended to family and friends. 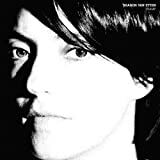 To celebrate the album's release I posted a collection of studio tracks and live performances by Sharon Van Etten today. To enter, name the last musician or band you recommended to friends. If you feel there hasn't been a decent album released since Jethro Tull's Aqualung, feel free to state that. The winner will be chosen randomly at midnight ET Friday evening (February 10th).